Another college football season brings out the newest fan gear so you can show off your team pride and this year we have brought in the Sleet Synthetic Polo Shirt from Colosseum for the Clemson Tigers which comes in Orange with a sublimated body. Made from 5.29 Oz. 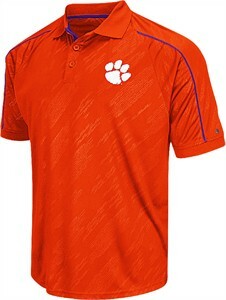 100% Rival Polyester which helps wick moisture away from your body to keep you cool and comfortable this Standard-Fit Golf shirt will look great on College Game Day or at the Golf Course and with its left chest embroidered Tigers graphic everyone will know which team you cheer for.